From his arrest, Clementina was relentless in her mission to have her husband released. She wrote many letters on his behalf, including letters to M.J. Coldwell, an M.P. from the Co-operative Commonwealth Federation of Canada Party (CCF), and as indicated in this case to J.S. Woodsworth, M.P. and the first leader of the CCF. Although ill, Woodsworth did personally write Clementina. Coldwell would also follow-up with Clementina (see ICEA2010-0008-0040). 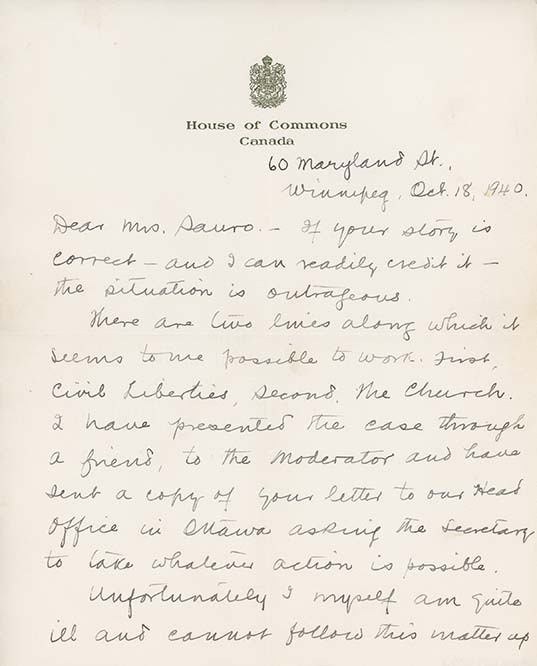 In fact, Coldwell raised the issue of Libero’s internment in the House of Commons, pointing out that Sauro’s sons were in the Canadian services. Other letters indicate that Coldwell continued to interest himself in Sauro's case and those of other internees (see ICEA2010-0008-0051, ICEA2010-0008-0052, ICEA2010-0008-0053).